How often have we asked that question when we’re in the midst of suffering? The disappointment we feel when things don’t go as we had planned, the pernicious doubts that dog us, the inconsolable grief at the loss of a loved one, the primal fear that we’ve been abandoned, all these can lead us to question whether God actually cares about us. 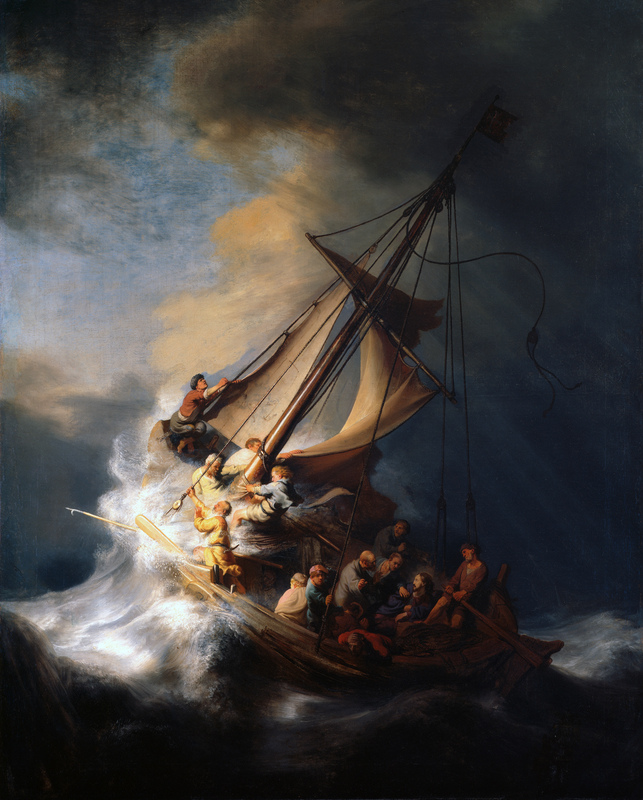 In Rembrandt’s painting, “The Storm on the Sea of Galilee”, his only seascape, we see the disciples in the boat as it is violently hurled upon a wave in the storm-tossed sea and rocks loom in the left foreground. Several men are desperately trying to take down the sails and we can see a tackle line that has already ripped away from its mooring and a torn sail flying about in the wind. The wiry bearded man at the far right is determinedly hanging on to the rudder but we can see that his effort is futile since it isn’t even touching the raging waters. One man vomits over the side while another behind him huddles in prayer. The man holding his hat and staring out at us is the artist himself, who has included his self-portrait in this early work. The Dutch painter Rembrandt Harmenszoon van Rijn(1606-1669) is one of Europe’s greatest artists, though his life was haunted by tragedy and financial difficulties. He was known as a master of narrative paintings and stories from the Bible are among his favored themes. We have looked at other works by him here and here. The detail (above) from the painting shows Jesus, identifiable by a slight halo or corona, being awakened by the disciples, one of whom has apparently reached out to shake him. This must be the very moment when they ask him, “Teacher, do you not care that we are perishing?” Rather than painting Jesus in the act of calming the storm, Rembrandt has shown us this moment when the disciples are filled with the greatest fear and doubt. I can certainly recognize myself in this moment, asking the Lord why he does not care enough to act in my life when I feel panic because my boat is being swamped. Even though Jesus has not yet calmed the storm, we can see hints in the painting that the Lord is acting though the disciples are unaware. As we look at the men wrestling with the sails, we notice that they are illuminated by rays of sunlight. This light is streaming diagonally across them from the blue sky appearing in the upper left portion of the canvas. The storm is already beginning to break. Of course. Rembrandt stares out at us as if to ask, “Why are you terrified? Do you not yet have faith?” This reminds us that even when, to our feeble perceptions, Jesus appears to be asleep in our own lives he is, in fact, working all things together for our good. When we are most afraid, we have only to recall that Christ is within us, an ever-present help in times of trouble. Reading that last line, I’m reminded that the story in Mark begins with Jesus saying, “Let us cross to the other side.” The journey is more than a sail across the lake, even more than the journey through life. It is our soul’s journey to our ultimate home country, abiding with Him in eternity. Postscript: Rembrandt’s painting was in the collection of the Isabella Stewart Gardner Museum in Boston until 1990, when the museum was the target of an infamous heist. Thieves broke in during the night and got away with an estimated $500 million worth of art, cutting the paintings out of their frames. To this day, the empty frames remain on the walls both in memory of their missing paintings, including this one, and in hope that they will one day be recovered. This entry was posted in Art, Bible, Faith, Religion and tagged art, art history, Bible, Catholic, Christian, faith, meditation, Rembrandt, scripture. Once again you have brought the Gospel alive through analyzing art. Beautifully done. The faintness of Christ’s halo perhaps serves to remind us of the weakness of human faith at some desperate times. I recall the Apostle’s poignant remark: “Now we see through a glass darkly, but then [in Heaven] face to face” (1 Cor 13:12). God bless! Rembrant is a favorite of mine. Thank you for weaving his work into today’s gospel! Wonderfully thoughtful. Thank you for taking me on this journey!